Today we’ll be working on a 2017 Kawasaki Ninja 650 ABS / Kawasaki Z650, but on most sport bikes these days it’s the exact same process. Actually, it’s pretty much the same regardless of if you’re working on a cruiser, a scooter, a dirt bike or even a lawnmower. So this should have some value for just about anyone. Step 8 – All Done? Not Quite Yet. D’oh! While generic lubricants might do, I prefer the specific stuff. One bottle will last you a decade so the expense is trivial. 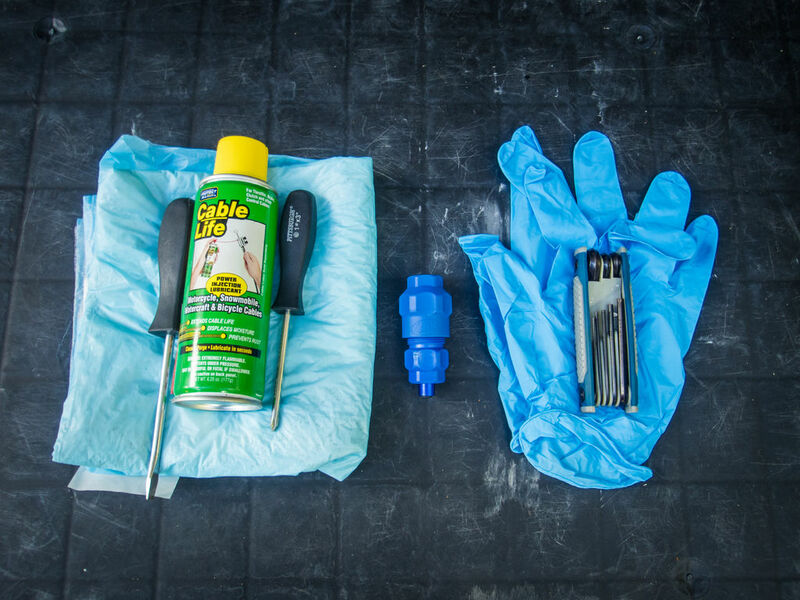 Cable Lube – You could use motor oil or other general purpose lubricants, but I wouldn’t recommend it. Considering that a small bottle will last you years, you’re better off getting the specific stuff. I’ve had a good experience with this product, so that’s what I’ll be using today. Cable Luber Tool – I used a cable luber tool, since it makes lubing the cable much easier and quicker. Not to mention cleaner. While I have tried the “normal” type of cable luber tool in the past, it has always been a nightmare for me, leaking everywhere except for inside the cable sheath. Their new model is so much better. If you wanna see more information on it, check out my Motion Pro Cable Luber v3 Review. days I love them during brake fluid changes, chain lubrication, oil changes and plenty of other maintenance work like this. Mostly thanks to it keeping me from having to clean up afterwards. You really shouldn’t be getting oil on your bodywork (or your concrete floor), and this is way more convenient than towels. Zip Lock Bag – You’ll need a small zip lock bag, or any small bag you have lying around. Roughly 3″ x 4″ would be a good size. Rubberbands – To seal the zip lock bags. 10mm Socket and Ratchet – To remove the throttle and clutch cable housing. Gloves – To keep clean. My compact gloves project comes in useful here. This is a puppy training pad. Yup. I’ll wait while you laugh. The first time I used it, it was simply to spend them since I no longer needed ’em. Or better said my dog didn’t. They turned out to be freakin’ awesome for drips and splashes. In this case, just cut a slit in the middle and pass the handlebar through it to avoid having to clean up the lube splashes later. For corrosive brake fluid they’re priceless. Step one is to go fetch the tools and prep the work area. One tip which I won’t get tired of repeating in the near future is how dog training pads are awesome for bike maintenance. They’re dirt cheap and both waterproof and absorbent, making them great for absorbing drips and splashes without having to clean up later. With corrosive fluids like brake fluid that really is priceless. Simply make a slit in the center and pass the handlebar through. Of course, you can use paper towels and a trash bag instead. If you’re doing this inside a garage, put some sort of protector under the bike, too. You can also use the training pads for that. The excess lube will be dripping under the bike. While the pad will protect the bike from oil splashes, it won’t do much when the ratchet handle bangs against the tank or you drop a wrench. A paint ding years ago taught me the hard way to always use a mechanic’s gas tank apron when working above the bike. Or at least throw a towel on top just to avoid accidents. Sooner or later it will happen to you, too. If you have a rear stand, you might wanna use it for convenience. With it, it is easier to lube the throttle and clutch control cables, but it’s not necessary. I used one since it makes working on the bike a lot more comfortable and safe. Mark the position of the clutch bracket in case you end up loosening it. On this bike there was an alignment point, but I’m so used to aftermarket clip-ons that I do it as a good habit anyway. Loosen (don’t remove) the clutch bracket bolts to better access the clutch pivot bolt. On most bikes a long 10mm socket is needed to remove this nut. It tends to be very hard to get the socket on the nut, so don’t worry. To get the cable out of the adjuster nut you’ll have to line up the slits just right. I’ll be starting with the clutch since it’s easier. Mark the position of the brake lever since most of the time you have to loosen it to remove the clutch lever. That way you can quickly leave it in the exact same position later. I almost always forget to do this until it’s too late. To remove the lever you’ll have to remove the nut on the bottom of the pivot screw, and then pull it out. On some bikes it screws out. To remove the cable from the lever, turn it upside down and rotate the cable out through the little slit for this purpose. To remove the cable from the bracket you’ll have to align the cable with the clutch cable adjuster nut. Your nut will look different from mine since I have a 8mm CNC Adjustable Cable Nut. Most bikes use the same 8mm thread. It was a cool cheap upgrade and I’m vain like that. Oh well. Maske sure the gasket is installed in this direction. This is how it looks properly installed. I consider cable lubing a worthwhile maintenance item, but boy did I hate doing it with the traditional type of cable luber. I don’t think I’ve ever been able to use one without making a mess. The new style from Motion Pro is certainly refreshing given that it actually works. Or better said, it works without leaking, making the task much simpler. If you’re interested in more info on the tool, check out my more detailed Cable Luber Tool Review. Now for some instructions. To use the Motion Pro Cable Luber V3, first you have to slip on the fat part of the body, and then the rubber gasket in the direction as pictured. Then, slide the cable down slightly and screw the other side on. If the thin cylinder is retracted (not poking out) then push it out from the inside with a Philips screwdriver or something similar. Do so being careful to not scratch the inside cylinder. Insert the tip (but just the tip, mind you) and lube ‘er up! You’ll know you’re done once clear, clean liquid begins to drip out from the clutch cable boot on the other end. Once you’re done lubing, press here to inject all the remaining lube inside the tool down through the cable. Finally, let’s lube that cable! If your motorcycle has a particularly dirty or sticky cable, or it’s been double-digit years since it was last lubed, consider using an air compressor first. With a blower attachment you can blow out any gunk, dirt or water out from the inside of the cable sheath. Just put the tip against the Motion Pro cable luber v3’s inlet and blow until you’re satisfied. That’s another unique feature of this tool. 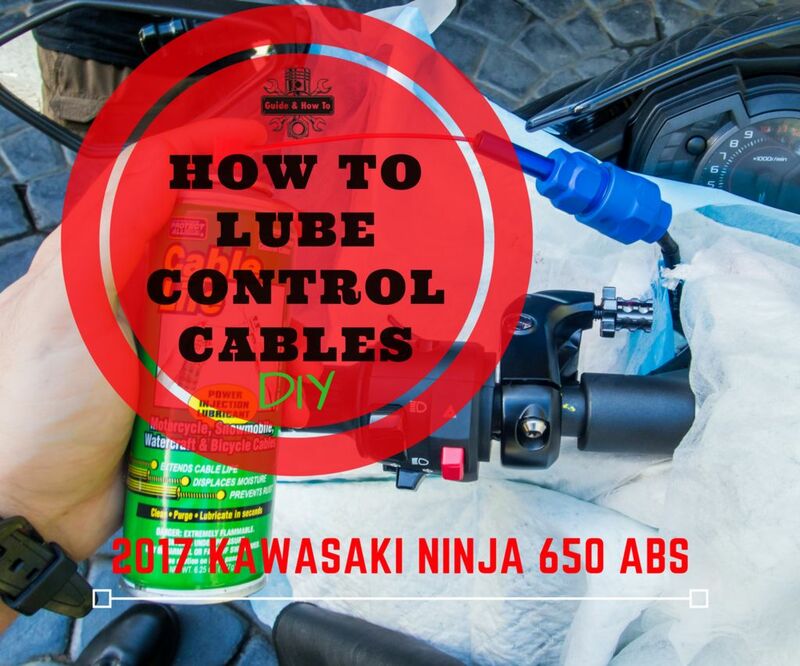 To lube the throttle and clutch control cables, you’re going to need some lube. So fetch it as well as one of those precision spray straws. To lube the cable, use the thin little red tube to “inject” it through the tool’s inlet. Do it in bursts given how the lube needs time to move through the cables sheath. Once clear fluid is dripping from the other side of the clutch cable (normally a rubber boot), you’ll know you’re done. Finally, press the thin metal cylinder to eject all remaining lube inside the tool out through the cable. Now would also be a good time to grease the pivot pin and housing using some generic waterproof grease. If the existing grease is old and gritty, replace it. Slide it through the same slit as before to reinstall it. Pretty easy. Use loctite before reinstalling. Tighten down good, but not so much that the lever binds. Remember to tighten back up the clutch lever bracket. After that the clutch cable is all done! Give it a wipe down and let’s move on. Now it’s time to reassemble the clutch lever. Thankfully it’s pretty easy and there aren’t any issues to watch out for. If anything just be careful with the little white plunger from the clutch switch. Remember to use blue threadlocker when reinstalling the clutch pivot bolt. Tighten it up well, but not enough that the clutch lever starts to bind. You’ll also have to readjust the clutch cable adjuster nut to leave it like before. In my case it was less important since I already had aftermarket adjustable levers installed. A pro tip is that if you want cheaper levers, the Z650’s levers are the same as the Ninja 650’s but tend to be cheaper and have more options. 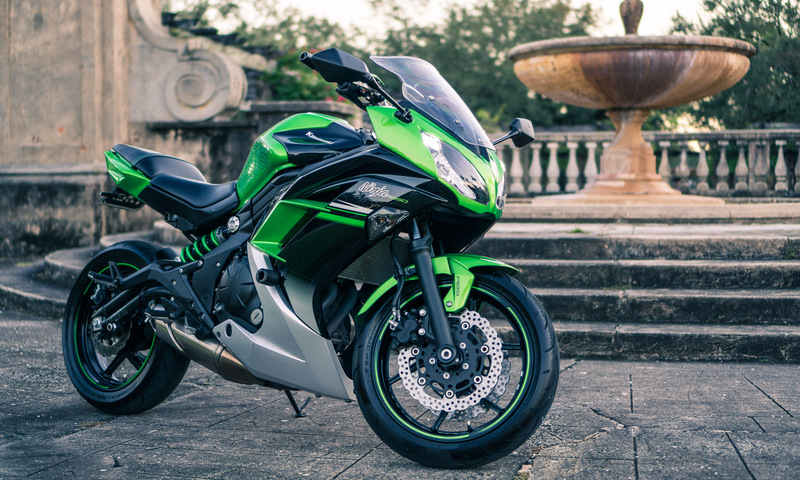 For more compatibility tips, check out the Ninja 650 parts compatibility list. If you have one of these cruise control accessories installed, you’ll have to remove it first. I’m a huge fan of cruise control on motorcycles. I definitely recommend the upgrade if you haven’t ever tried it. It just bolts on. For the throttle side, use a philips screwdriver to remove the two bolts on the housing. Take note of the cable routing. It’s always a PITA to reassemble afterwards. Now it’s time to tackle the throttle cables. In my case I had to remove the cruise control first. It was just 3 bolts to get it out-of-the-way. If you’ve never tried cruise control on a motorcycle, definitely go for it. 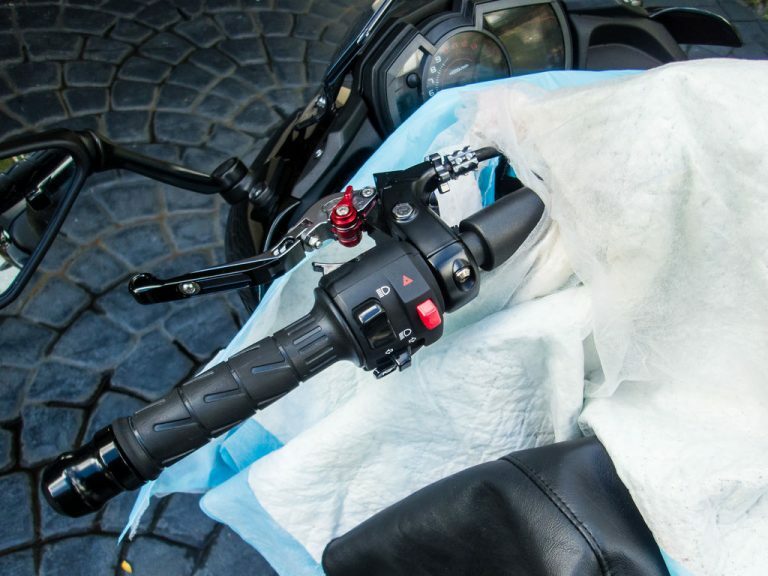 It’s an awesome upgrade for long trips, or simply to adjust your jacket while riding and things of the like. I can’t live without it these days. Remove the two bolts on the back of the throttle cable housing and slip both sides out. Take a good look at the cable routing since it tends to be a hassle to get it right when reassembling. There are two throttle cables. Do the easy one first. It’s the same process as before. This throttle cable is more complicated because that elbow cannot be removed. We’re gonna have to go old school and use the plastic baggie + rubber band method of cable lubrication. Just cut off a corner of the baggie as pictured. Pass the cable through the baggie through the cut corner, and wrap the rubber band around it until it’s tightly. Then pull the baggie inside out. That way the rubber band stays on the inside and the whole assembly is leak-free. Cable Life really should be sponsoring this DIY with all the product placement! They aren’t though. I just like the stuff. Hold the bag upright and let the lube work through the cable. Keep moving the cable every so often. On many bikes, it isn’t always the same process to lube the throttle and clutch control cables on both sides. In this case, lubing the throttle cable is a bit more complicated. But not much. Let’s go step by step. There will be one cable with a thin metal tube. Lube that one just like you did the other side. After that is taken care of, we have one cable remaining. Thanks to the plastic elbow installed on it, regrettably there is no way to attach the tool. We’re going to have to go with the old-school method. It’s slower but does the job good enough. Cut off a corner from a ziplock bag and grab a rubber band. Pull the zip lock bag inside out and slide it over the cable, including the elbow. Attach the rubber band tightly around it. Then reverse the zip lock bag over the rubber band and elbow. If that wasn’t clear, take a look at the pictures. Now you can squirt lube into the bag and wait for gravity to do the job for you. Keep the bag high up, and move the cable back and forth so the lube moves through it quicker. Once you’re done, remove the bag. On the vast majority of Fuel-injected modern bikes, the throttle cables have open ends just like the clutch cable. If your bike is carburetted, it is typical for the cable to end up inside the carburetor housing. If that’s the case you’ll have to remove the cable end from its housing before lubing to avoid pooling the carb with dirty cable lube. This is the throttle body where the throttle cable attaches. This cable stop slipped out of its place while lubing the cable. We simply have to put it back into its place as pictured. If you want to adjust the throttle cable free-play, adjust this knob next to the front forks. You can also adjust the ridged knob on the elbow we put in the zip lock before. I really appreciate having a throttle with as little free-play as possible. So now we just reassemble and grab a beer? Hmm. Apparently not. 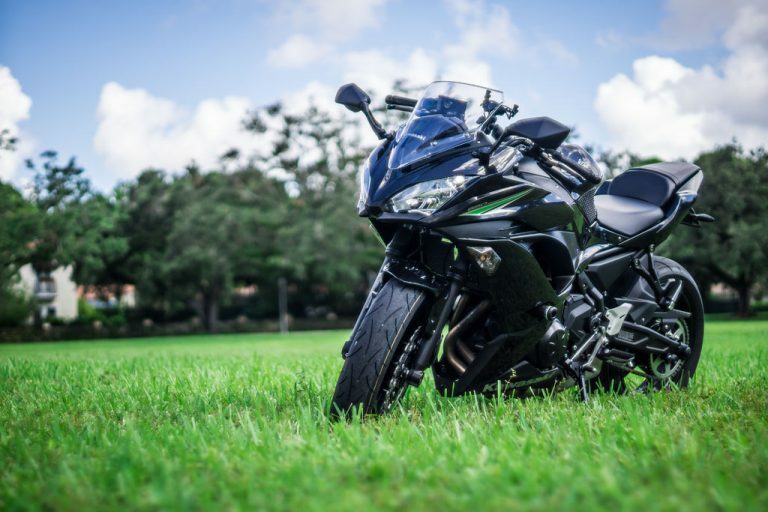 It’s easy to lube the throttle and clutch control cables, but that doesn’t mean one shouldn’t be careful. In real life things don’t always go as smoothly as those generic 3 minute YouTube motorcycle How-To’s would make you think. I screwed up. Sorta. When I went to reassemble the throttle housing I noticed that the throttle had no tension. It’s a trivial issue, but if you weren’t expecting it, it sure can make you nervous and regret having touched anything in the first place. Thankfully it’s an easy fix. If it’s even important enough to call it an issue to begin with. When I pushed the throttle cable into the sheath so it would fit inside the cable lube tool (not the zip lock one), I apparently pushed the cable stop out of its slot on the other side of the cable (throttle body side). To reattach it, it only takes a few minutes. Less than 5, I promise. If this happens to you, remove the two screws on the right side of the bike to expose the throttle body. Then simply push the cable stop back into its slot as pictured. That’s all. It certainly will make you nervous if it catches you by surprise, but it’s really not a problem as much as it’s just a small extra hassle. Now that that’s sorted out, we can finally reassemble the throttle cable housing. Take note to route the throttle cable properly and tighten it up. By the way, if you liked the cute little CNC Brake Fluid Cover, Ebay is a great spot to get one. Also, the Z650 covers are perfectly compatible with it and tend to be cheaper and have a greater selection. You can find that along with all the other upgrades I’ve done to my bike in my 2017 Kawasaki Ninja 650 mods list. Isn’t it nice to spend some quality time getting to know your bike, isn’t it? Not to mention crossing out another maintenance item from the to do list.